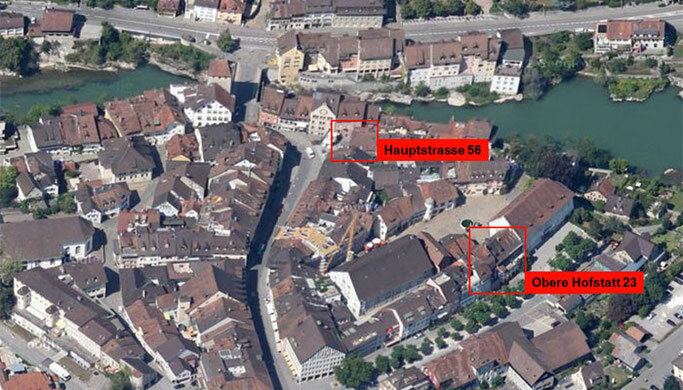 Rooms in Brugg has been providing modern and centrally located (5 minutes walk from the Brugg train station) accommodation for young people in refurbished properties in the old town of Brugg since 2008: at Hauptstrasse 56 and at Obere Hofstatt 23. Our houses combine the charm of historic buildings with modern furnishings and fittings. Thanks to the central location various sports and recreational facilities are found in close proximity. The administration of the houses works largely autonomously (e.g. the selection of new tenants). Especially for foreign guests the houses facilitate easy social integration through networking with co-tenants. The monthly gross rent is dependent on the size and equipment of the room, it varies between CHF 465 and CHF 890. The gross rent is the sum of the net rent and a monthly downpayment for utilities of CHF 90. Upon receipt of the final annual bill from the city utility, utilities costs are settled per room. As part of a medieval town ensemble, both properties naturally do not have parking facilities. If such are required, they can be rented at the Eisi parking (web site in German only), which is 3 minutes walking distance from the houses.